Except for its windows, tires and chassis, just about every part of the LSEV is made from polyamide, or nylon. "To me, XEV is the first real mass production project using 3D printing," said Dr. Luo Xiaofan, the co-founder of Polymaker in a clip touting the project. "When I say 'real,' of course there has been other companies using 3D printing for production, but nothing can really compare with XEV in terms of the scale, the size and the intensity." 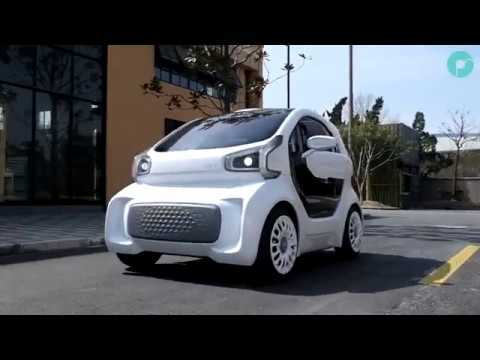 According to media reports, the car has already received 7,000 pre-orders from the Italian postal service and Arval, a car sharing service owned by BNP Paribas. If everything actually goes to plan, it's a pretty genius move to combine electric cars with 3D printing—two rapidly booming industries. Experts predict that electric vehicles will make up 35 percent of global new car sales by 2040 and will soon become cheaper than purchasing and running a traditional gas guzzler. The 3D printing market—which is expected to cross $13 billion—could help buoy the EV sector because it offers endless customization options and could drastically cut development and production time and costs. Case in point, the 950-pound LSEV is made from only 57 parts, whereas a typical car weighs twice as much and has more than 2,000 parts. "The research and development process of a car model conventionally takes between three to five years, but 3D-printed cars like XEV only take between three months to 12 months," said Luo. Investment costs were also reduced more than 70 percent in comparison with a conventionally manufactured vehicle, he noted. China has emerged as a major electric car buyer. In an effort to slash emissions and curtail its notorious pollution problem, the Chinese government offers big subsidies to electric car manufacturers. Guo Xiaozheng, a senior designer at XEV, told the South China Morning Post that Beijing plans to issue new laws for low-speed electric vehicles by the second half of this year, meaning its cars could become even cheaper in the near future. "Production costs can be slashed further as volume increases and by 2024, the total costs for our cars will be cut by half," Guo said. A prototype of the LSEV is currently displayed at Shanghai's China 3D-printing Culture Museum. It will also be exhibited at Auto China 2018 in Beijing next month.